Upon entering the Luxor hotel and resort, there is an instant awareness to the opulence that was infused into every inch of the Egyptian themed local. Luckily for the nightclub crowd, that extravagant nature did not just stop at the property's casino and hotel, and found itself leaked into the attached nightclubs. 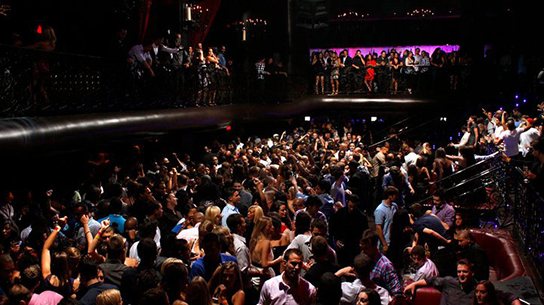 One such club, LAX, represents everything that the Las Vegas nightlife has to offer, and thanks to the popularity behind the Luxor itself, LAX is one of the most popular nightclubs in the city. The moment you step into this 26,000-square foot behemoth, you'll have no question as to the purpose behind the existence of LAX. It is an expansive party space that, in the past, has housed the likes of celebrities such as the Black Eyed Peas and Ice T. While many newer clubs are built to house different rooms with different purposes, LAX is the ultimate party space that throws everything it offers right on the table. Any fan of the color red will find themselves comfortably at home within the space at the Luxor. Decorated in red accents and basked in an accompanying red glow, this club utilizes the standout color as accentuate its finer points. Your entrance into the club comes in the form of a classical wrought-iron door which opens up onto a staircase that leads up through a seductively dark hallway. The theme for LAX follows a gothic tone, and this overstated entry is the perfect indication of the general decor. Once inside the large club, you're given the option to continue your journey upwards to the upper hallway or venture down to the lower floor, where you'll find yourself facing the club's expansive dance floor. At the head of this typical dance floor arrangement is the DJ booth, where resident and celebrity DJs will provide a night filled with non-stop entertainment. If you're lucky enough to be granted a VIP status, you'll find your seating arrangements surrounding the club's dance floor. This optimal placement ensures you'll never be too far from the party, but you'll still have your own private space to retire to when the party starts to get too hot. On the upper level of the club, you can hang over the 2nd-story balcony for a birds-eye view of the party below. Your 2nd level vantage point will also lead you to the club's second bar (the first being at one end of the dance floor) and a small seating area outfitted with comfortable booth seating. By this smaller bar there is a smaller area to groove in if the main dance floor starts to become an encumbrance to you. Though the club's medieval looking, dungeon-esque door seems less than inviting, LAX is the hottest scene in Sin City. Once you pass through the dark hallways and gothic décor, you'll find that there are no obnoxious gimmicks or unwanted quirks; everything about LAX is simply out in the open, for all the club goers to enjoy. 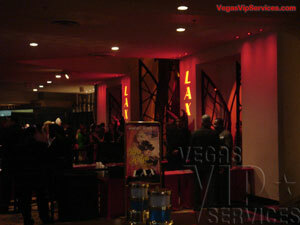 Contact Vegas VIP Services to reserve your Bottle Service at LAX Las Vegas. LAX Nightclub is not my favorite, if you don't have table, you get pushed left n right, no space for just dancing or drinking, 90% of the club is dedicated for bottle service area and not everybody can afford it. 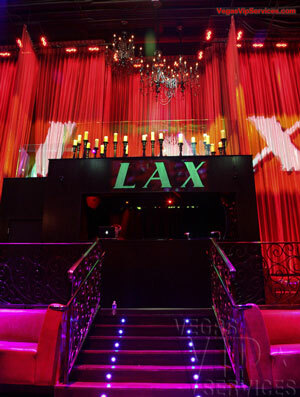 LAX located at the Luxor is a 26,000 square foot, two story club. It occupies the same space the former RA nightclub resided in, but it is the aftereffect of a $20 million dollar facelift. LAX is outfitted in rich, red leathers and adorned with oversized mirrors, shimmering chandeliers, and floor-to-ceiling red drapery. It is the newest addition to the clubs run by PURE management. Britney Spears hosted the opening night on Labor Day weekend 2007.